Weld-cracking is a most dangerous situation. It compromises the ability of a welded structure to perform the design functions in a safe and consistent way. Cracks are discontinuities presenting fracture. They have two dimensions quite large relative to their opening, and a sharp tip that tends to propagate under stress. Therefore cracks must always be avoided or eliminated. In previous pages we briefly considered Weld Cracking as a danger and cracks as unacceptable defects (Click on Welding Defects). We discussed some welding conditions that may promote the appearance of cracks (Click on Alloy Steels). Here we wish to present the different types of Weld cracking discussing the conditions for their appearance and the measures that can be employed to avoid them. Of the four types of cracking discussed here, hot or solidification cracks appear near the end of the solidification process in the fusion zone. They result because of the incapacity of the molten and semisolid material to absorb without tearing the thermal shrinkage strains due to weld solidification and cooling. Weld-cracking, formed in the weakest places like grain boundaries, relieves the associated stresses. Some microstructures are more prone than others to the formation of solidification Weld-cracking. 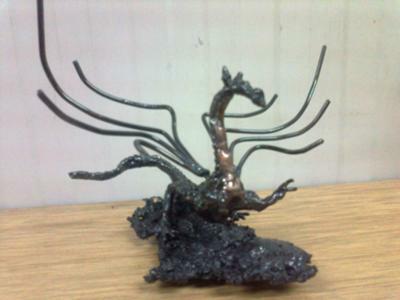 The presence in the metal composition of low melting elements like sulfur, lead, bismuth etc. is deleterious. The tendency of certain metals to exhibit hot Weld cracking is called hot shortness, caused by low-melting constituents segregated at grain boundaries. For welding, these susceptible compositions should be avoided. (Example: free machining -steels or -stainless steels). Welding parameters should be selected with care. They can influence the formation of hot Weld-cracking by the rate of strain application (lower rate = lower danger). It is higher for welding processes that cause rapid solidification and cooling. Joint design should strive to limit the molten mass, joint gap should be contained and good fit-up should be preferred, in order to reduce shrinkage strains and Weld-cracking. Weld speed, an important productivity factor, may have to be contained at such low levels that do not cause solidification Weld-cracking, other data being constant. For any given alloy there may be a possible range of welding parameters that permits avoiding hot Weld-cracking. This range is narrow for alloys with a large melting interval, that are more prone to hot shortness. On the contrary, alloys with a narrower melt interval enjoy a larger range of possible welding parameters. It so happens because cumulative shrinkage strains are proportional to the magnitude of that melting temperature range, that depends essentially on chemical composition. Crater cracks are a common occurrence at the end of a weld if the welding current is interrupted abruptly. It should instead be reduced gradually, possibly directing the arc on top of an already welded beam. Solidification cracking susceptibility can be measured in different alloys by performing a series of tests, (Varestraint Testing) and measuring the maximum length of the induced cracks. A short note on Varestraint Test was published (9.6) in Issue 14 of Practical Welding Letter for October 2004. Click on PWL#014 to see it. The results permit to rate the different compositions as to their hot Weld-cracking susceptibility. are cracks that develop in a place of partial melting occurring near the Heat Affected Zone (HAZ), bordering on the fusion line. As partial melting occurs below the melting point of the alloy, local thermal strains can induce grain boundary separation similar to what explained above. HAZ cracks, may occur with or without the presence of liquid. Failures happen if the thermal stresses associated with the weld thermal cycle exceed the local tensile strength at the actual temperature. The above occurs if brittle structures associated to intermetallics are present. Some alloys undergo microstructural transformations in the Heat Affected Zone as a consequence of thermal cycles brought about by welding. Typical is the martensitic transformation, producing a hard and brittle crack-susceptible structure, which is accompanied by a volumetric change inducing noticeable stresses. Hydrogen induced delayed cold Weld-cracking occurs as a consequence of contamination with this gas being absorbed in the molten metal while welding. Hydrogen sources should be avoided and removed: not only water and humidity must be controlled by drying and preheating. Organic matter contamination has to be removed by cleaning and good housekeeping. at least a critical level of hydrogen. A long standing theory claimed that atomic hydrogen moving interstitially within the solid metal aggregated to molecular form with pressure increase sufficient to tear apart metallic bonds. This has been recently challenged and replaced by a competing model involving the presence of preexisting defect sites in the metal, where, under stress, hydrogen preferentially diffuses, reducing the local cohesive strength. Fracture occurs when the remaining strength falls below the intensified stress level. Hydrogen would then accumulate in the newly generated voids and the process would repeat itself. Hydrogen induced Weld-cracking is a serious cause for concern especially with high strength steels. Preheat and postheat procedures, depending on material type but also on thickness and joint constraints, are commonly employed to reduce the danger of hydrogen Weld-cracking. to allow for hydrogen gas to escape if entrapped. An Article on Preheating, a technique useful for reducing the risk of Weld-cracking, was published in Section 2 of Issue 37 of Practical Welding Letter for September 2006. To read the article click on PWL#037. Lamellar Tearing is a kind of Weld-cracking that forms beneath a weld. It is a dangerous condition occurring when certain plate materials presenting low ductility in the thickness (or through) direction are welded to a perpendicular element. The reason for low ductility is generally the presence of laminations or flat type discontinuities due to flattened extraneous inclusions. Tearing always lies within the base metal, generally outside the HAZ and parallel to the weld fusion boundary. The problem is caused by welds that subject the base metal to high shrinkage stresses in the thickness direction. Tearing, as well as laminations, are not visible on the outside, generally, but they can be found by ultrasonic testing. The problem can be avoided by selecting base material having adequate ductility in the thickness direction, that has been screened by ultrasonic testing for absence of laminations or other internal defects. It can also be managed by paying due attention to joint details and avoiding massive welds that develop significant shrinkage stresses. Although appearing sometimes long after welding, a structure stress relieved and ultrasonically tested for lamellar tearing after welding should be considered safe. Special design details were developed for corner joints, to put the bulk of shrinkage stresses in the direction of rolling of one of the elements, and freeing the other element from stresses in the through direction. An Article on Lamellar Tearing was published (7) in Issue 46 of Practical Welding Letter for June 2007. An Article on Stress Corrosion Cracking (SCC) was published (7) in Issue 61 of Practical Welding Letter for September 2008. Click on PWL#061 to read it. An Article on Cracks in Welds was published (7) in Issue 68 of Practical Welding Letter for April 2009. Click on PWL#068 to see it. An Article on Delayed Failure was published (7) in Issue 76 of Practical Welding Letter for December 2009. Click on PWL#076 to see it. An Article on Benefits of Low Hydrogen Filler Metal Electrodes was published (4) in Issue 141 of Practical Welding Letter for May 2015. To receive every issue of Practical Welding Letter as it is published, please subscribe. Let us remind you that, if you are interested, we offer a no cost subscription to our Practical Welding Letter and a bonus book in pdf format to be sent to your computer on PRACTICAL HARDNESS TESTING MADE SIMPLE. Click on Subscription. Checking the hardness of an unknown material before welding may help avoid Weld-cracking.